Along the Lower Moyamensing neighborhood, Cambodia Town serves some of the most authentic asian food in South Philadelphia. None of these little eateries have the grandeur of Washington Ave or Chinatown restaurants, but they have quality and richness of authenticity. The loyalty of the locals who have tried and loved their food have helped them prevail in South Philly for decades. Influx of new residents have led to newly found fame of some of the restaurants in the once self-contained neighborhood. It will still takes courage to venture out to the unfamiliar ground and cross the language barrier. Be adventurous. Cafe Vinh Long (2225 S 7th St; 215-334-8505; vinhlong.farphilly.com) is a small, simple restaurant cafe that makes fresh Vietnamese hoagies, or banh mi, right in front of you. Sure, you can travel to Washington Ave and other parts of South Philly to eat the mainstream Ba Le hoagie, or you could try this hidden gem. The Vietnamese coffee are made to order with French coffee drips. 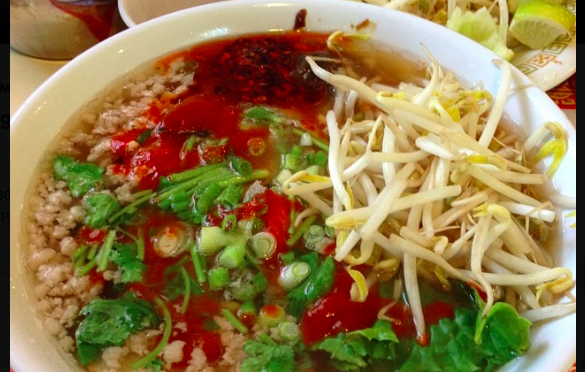 New Phnom Penh (2301 S 7th St; 215-389-2122) is a hole-in-the-wall, less than 10-tables seating cafe that serves the absolute best Phnom Penh Noodle Soup (Hu Tieu Nam Vang) in Philadelphia. The streets around here are small, with less than inviting looks and some language barriers – but don’t let that stop you from trying some of the best Cambodian comfort food in the city, as reviewed by the Philadelphia Weekly.